Consider whether flexibility in implementation of financial services regulation can undermine legal certainty. Does a move towards principles-based regulation of financial services presage a regulatory creep without a statutory grounding or does it allow regulators to keep pace with the financial services market? In the UK, the Financial Services Authority (FSA) has four statutory objectives: market confidence (maintaining confidence in the financial system); public awareness (promoting public understanding of the financial system); consumer protection (securing the appropriate degree of protection for consumers); and reduction of financial crime (reducing the extent to which it is possible for a business carried on by a regulated person to be used for a purpose connected with financial crime). 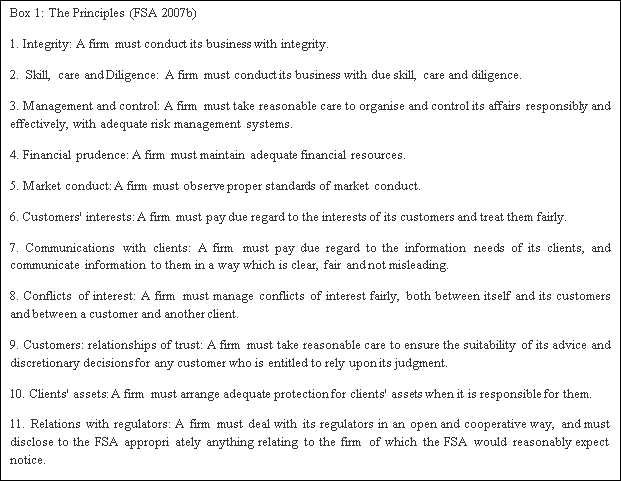 In addition, the FSA is guided by a set of principles to which it must adhere. For example, it must use its resources efficiently, and any restrictions it imposes on an industry must be proportionate to the expected benefits of the restrictions. Furthermore it should avoid stifling innovation where possible. This means that the FSA must allow for different means of compliance in order not to unduly restrict firms and industries from launching new products and services. In addition, the FSA should help to maintain the competitive position of the UK internationally. In order to promote competition among the firms that it regulates, the FSA should avoid creating any unnecessary regulatory barriers to entry or expansion in any of the markets it regulates. Hodgson (2006:251) explains that the ‘FSA was set up to do rather a lot of things: to promote market confidence and public awareness of financial services (meaning encourage savings), protect consumers and reduce financial crime. It is also required to maintain the international success of Britain’s financial sector, promote competition whilst minimizing any adverse effects, and weight the costs and benefits of its own actions. Plenty of scope for conflicts of interest there.’ An assessment of the move to more principles-based regulation must examine how such a move is likely to impact on all of the objectives of the FSA. Cunningham (2007) explains that since the Enron scandal and other debacles in the financial services industry, there has been a trend to categorise rules-based regulatory systems as bad, and principles-based regulatory systems as good. However, he argues that the distinction being made between “rules-based” and “principles-based” systems is false and misleading. Cunningham (2007:3) claims that while an individual provision in a regulatory system may be “rules-based” or “principles-based”, these ‘classifications are too crude to describe or guide the design of corporate law, securities regulation or accounting systems.’ That is to say the terms are not scalable to the level of an entire system. Instead, Cunningham (2007:4) points to ‘the necessity and value of combining rules and principles and the difficulty of designing systems warranting classification as rules-based or principles-based.’ While it may be the case that any regulatory system is necessarily a hybrid made up of a mixture of “rules-based” and “principles-based” individual provisions, that does not mean that some systems are not “more rules-based” or “more principles-based” than others. Indeed this notion ties in with the reality of the UK financial services regulatory system. As will be seen below, the system is already a hybrid of “rules-based” and “principles-based” approaches, and it is moving towards “more principles-based” regulation. There are clear advantages to a principles-based approach to regulation, but such an approach also carries certain risks (of which regulatory creep is just one). The challenge is to achieve the right balance between principles and rules. As the BRTF (2004:6) explains, ‘part of the attraction of goal-setting regulation is its flexibility and we do not want to discourage this. Nor do we want to discourage the use of guidance as a useful alternative to regulation for driving up standards. But where does guidance as a useful alternative in driving up standards end, and regulatory creep begin?’ In this section, I will review the pros of a move towards more principles-based regulation, and I will then outline the various risks or cons associated with such a move. One major advantage of more principles-based approaches to regulation is increased flexibility and responsiveness to innovation and market developments. de Serres et al (2006:32) find that ‘financial system regulation has a statistically significant influence on output and productivity growth as well as on firm entry, via the impact on industrial sectors relying more heavily on external sources of funding. The economic impact is also found to be substantial enough to matter, yet sufficiently small to remain credible.’ This highlights the need for financial system regulation to minimise unnecessary regulatory barriers to entry or expansion in the financial services market. Perhaps one of the most important potential advantages of a move to more principles-based regulation, if properly implemented, is a greater degree of substantive compliance as individuals and firms come to comply with outcomes and the general principles rather than on the detailed rules – as the spirit of the law is prioritised over the letter of the law. Finally, proponents of a more principles-based approach argue that it should lead to more efficient solutions to regulatory problems. This, however, depends on the system for the resolution of any such problems and could in fact be more or less efficient with a more principles-based approach, depending on how that system is designed and implemented. There may also be certain legal obstacles to a more principles-based approach to regulation. Obviously any regulatory body needs to remain within the law, and in the case of the UK FSA this includes, for example, EU law. It is important to recap at this stage that a move to more principles-based regulation does not mean the abolition of all detailed rules. Indeed the FSA (2007a:20) cites European legislation as one of the challenges or constraints that will remain as they move in the direction of a more principles-based system of regulation. Clearly there are some advantages to Principles-based regulation of financial services, but there are also some risks. There will always be a place for rules in regulation, and the key to successful Principles-based regulation is to know when it is appropriate to rely on Principles, and when to specify detailed rules. Reliance on principles requires the provision of consistent advice to firms, and a commitment to ensure the regulator’s accountability mechanisms are not bypassed. These requirements in turn point to the need to ensure that compliance staff are sufficiently skilled and trained. A move to more principles-based regulation has the potential to presage a regulatory creep without a statutory grounding as well as the potential to allow regulators to keep pace with the financial services market. The aim of any such move must be to realise this latter potential whilst avoiding the former. Better Regulation Task Force (2004) Avoiding Regulatory Creep. October 2004. London: Better Regulation Task Force. Cunningham, L. (2007) A Prescription to Retire the Rhetoric of “Principles-Based Systems” in Corporate Law, Securities Regulation and Accounting. Boston College Law School Legal Studies Research Paper Series, Research Paper 127, 13 March 2007.
de Serres, A. et al. (2006) Regulation of Financial Systems and Economic Growth, OECD Economics Department Working Papers, No. 506. Paris: OECD Publishing. FSA (2007a) Principles-based regulation: Focusing on the outcomes that matter. April 2007. London: FSA. OECD (2005) Designing independent and accountable regulatory authorities for high quality regulation. Proceedings of an Expert Meeting in London, United Kingdom, 10-11 January 2005. Paris: OECD. "Financial Services Regulation Literature Review." UKEssays.com. 11 2018. All Answers Ltd. 04 2019 <https://www.ukessays.com/essays/finance/financial-services-regulation-literature-4241.php?vref=1>. "Financial Services Regulation Literature Review." All Answers Ltd. ukessays.com, November 2018. Web. 20 April 2019. <https://www.ukessays.com/essays/finance/financial-services-regulation-literature-4241.php?vref=1>. UKEssays. November 2018. Financial Services Regulation Literature Review. [online]. Available from: https://www.ukessays.com/essays/finance/financial-services-regulation-literature-4241.php?vref=1 [Accessed 20 April 2019]. UKEssays. Financial Services Regulation Literature Review [Internet]. November 2018. [Accessed 20 April 2019]; Available from: https://www.ukessays.com/essays/finance/financial-services-regulation-literature-4241.php?vref=1.